Rapper Meek Mill’s recent sentencing to two to four years in prison for a parole violation has been deemed disproportionately harsh by many—including the FBI, which is reportedly investigating charges of bias on the part of the Pennsylvania judge who handed down the sentence. Now JAY-Z, who owns the Roc Nation record label to which Meek Mill is currently signed, has joined the protest against the sentence with an op-ed in today’s New York Times. “The specifics of Meek’s case inspired me to write this. But it’s time we highlight the random ways people trapped in the criminal justice system are punished every day,” he continues, citing the statistics that one-third of the 4.65 million Americans currently on some form of parole or probation are black, and that black people are much more likely to go to prison for parole violations than white people. “Probation is a trap and we must fight for Meek and everyone else unjustly sent to prison,” he concludes, recommending that readers go to the Color Of Change website to sign a petition demanding that Judge Genece Brinkley recuse herself from the case. Meek Mill is currently scheduled to appear at a bail hearing in front of that same judge at Philadelphia’s Center for Criminal Justice at 9 a.m. on November 27, as The Fader reports. 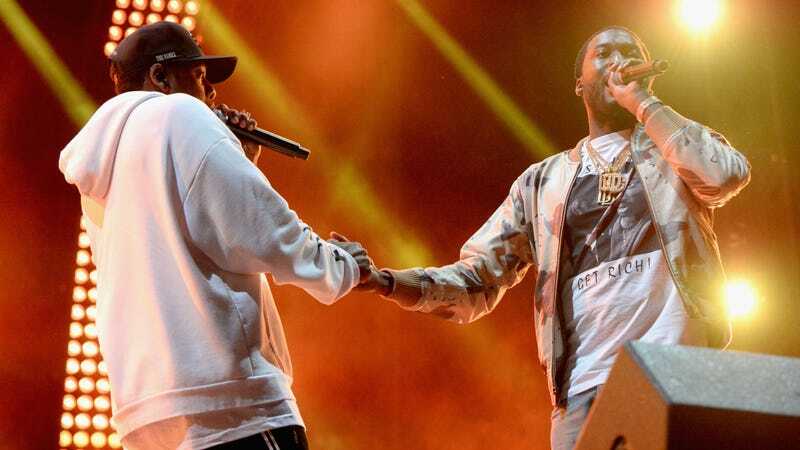 Earlier this week, supporters held a rally in front of the Criminal Justice Center, and Meek Mill’s lawyers filed a motion to recuse Brinkley from the appeals case.